Yes! Its my 100th post. I have one more good news to share. My blog turns a year old this month. It feels so good. Never thought I have so many recipes to share. 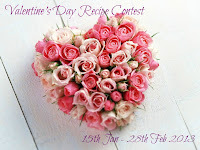 Just started blogging to keep a detailed note on my cooking experience and dishes which i tried and which is loved by my family and friends. It feels so good when someone appreciates our work and here I am where in people across the world do like my recipes, appreciate it, try it, love it and come back to say thanks. So kind of them . Just because of my encouraging visitors, I am her posting my 100th post. Thank you all for the support. 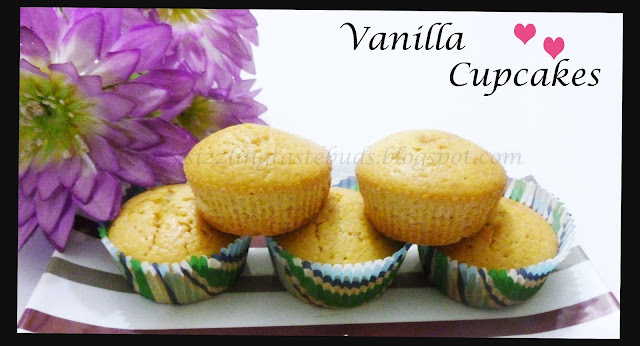 Today's post is a simple Butter free Vanilla Cup Cakes. This is a super duper hit at home. I have not topped these with any icing or frosting as we love to have them plain. You can go ahead and decorate with icings of your choice. These are best to try for kids birthday parties and also to send them to school in snack box. My son always does this. He saves atleast two for his snack box for the next day. 1. Sift all the dry ingredients mentioned above except sugar. 2. Powder the sugar and beat it along with eggs. Add oil, vanilla essence and milk to this and beat it again with an electric beater till everything combines. 3. 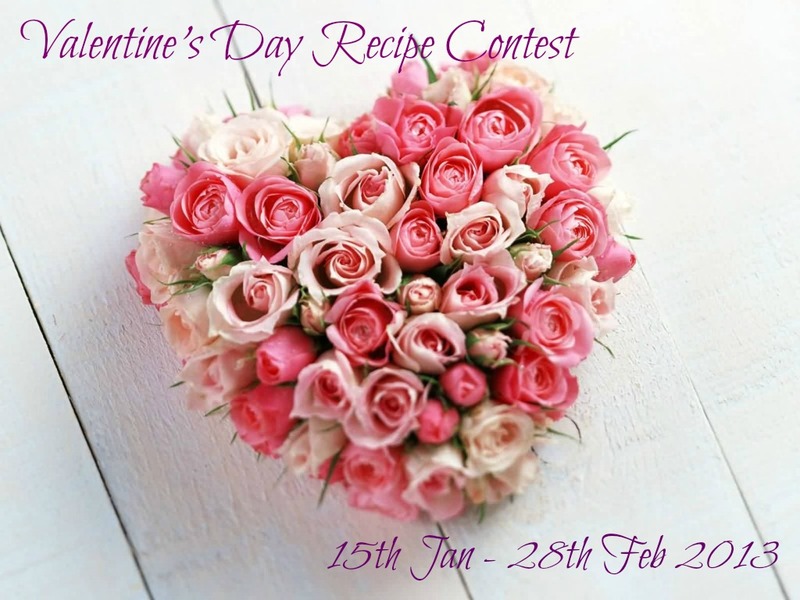 Add the sifted dry ingredients to the egg mixture and mix it well. Adjust the cake batter consistency with little more milk if needed. 4. Preheat the oven for 10-15mins. 5. 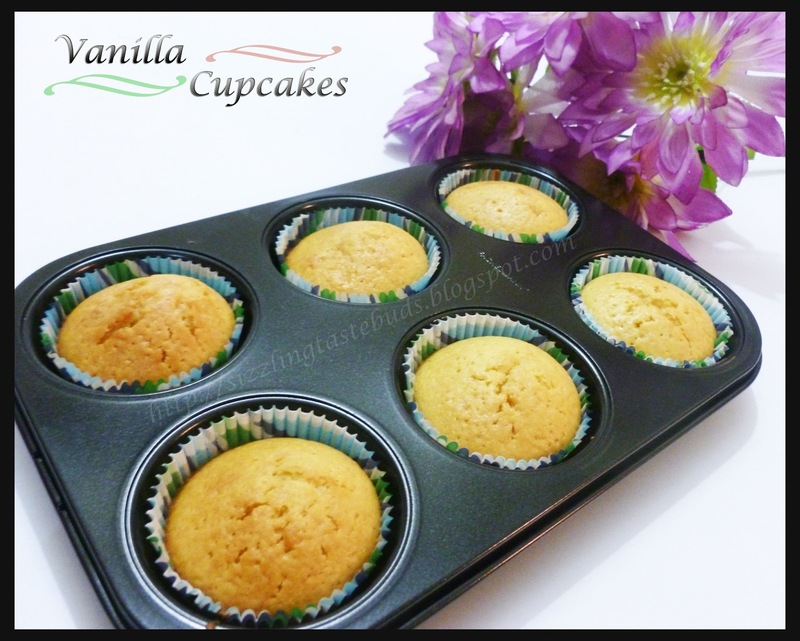 Place the paper cups in the cup cake moulds. Pour batter into these paper cups filling about 3/4 allowing the rest space to raise. 6. Place them in oven and bake for 40 mins at 180C . Timing and temperature differs from oven to oven. So bake it accordingly. 7. Once done, remove them from mould and place it on a wire rack for cooling. This recipe makes exactly 12 cupcakes. Congrats on your mile stone dear! Yumm... really a good looking cup cakes... nice click. 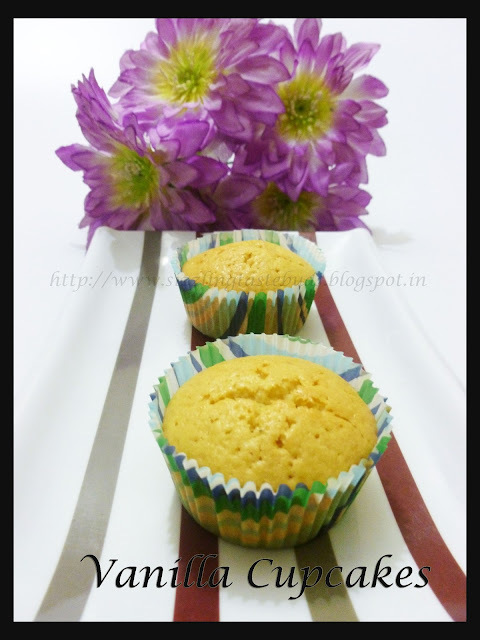 congratulation on 100th post & blog-versary... :) lovely pics and reall tempting cupcakes.